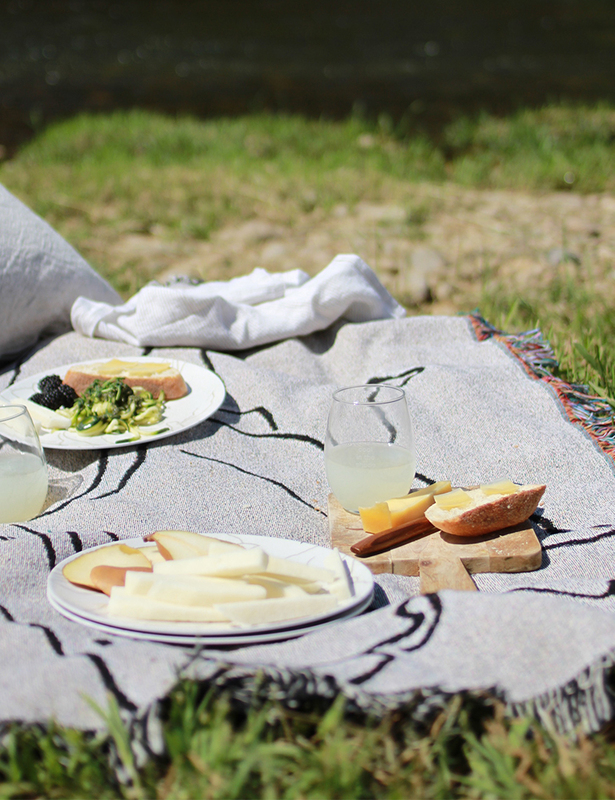 It's the perfect season for eating outside, with the long Summer days and warm evenings creating the ideal climate for taking your meals outdoors. On our small patio is a cozy place to grill and eat with the kids but it doesn't allow us to really spread out so when Shutterfly approached me to give my take on an outdoor meal I knew I wanted to be near water! Do you remember when I talked about brainstorming ideas for an upcoming project? This is the article I was referring to. Shutterfly allows you to customize textiles, glassware and even plates to create something truly unique, allowing you to achieve whatever look you're going for. 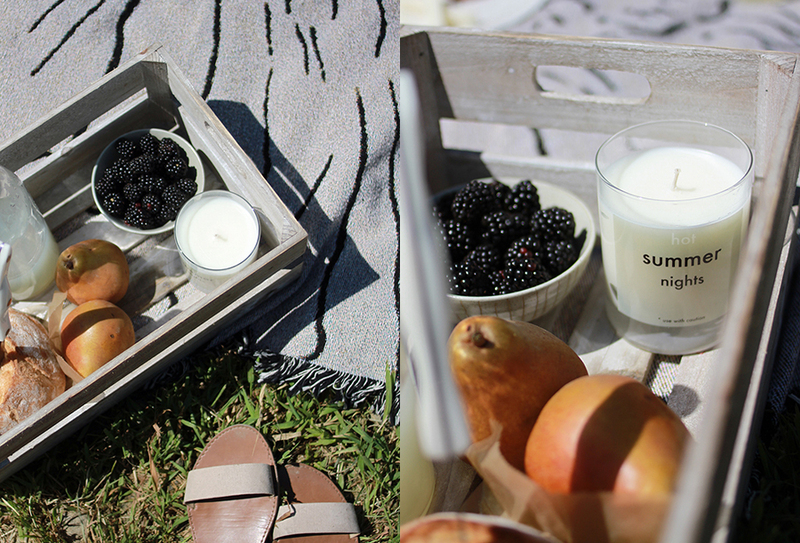 Here are some of the things I used to create this laid back meal with a view. 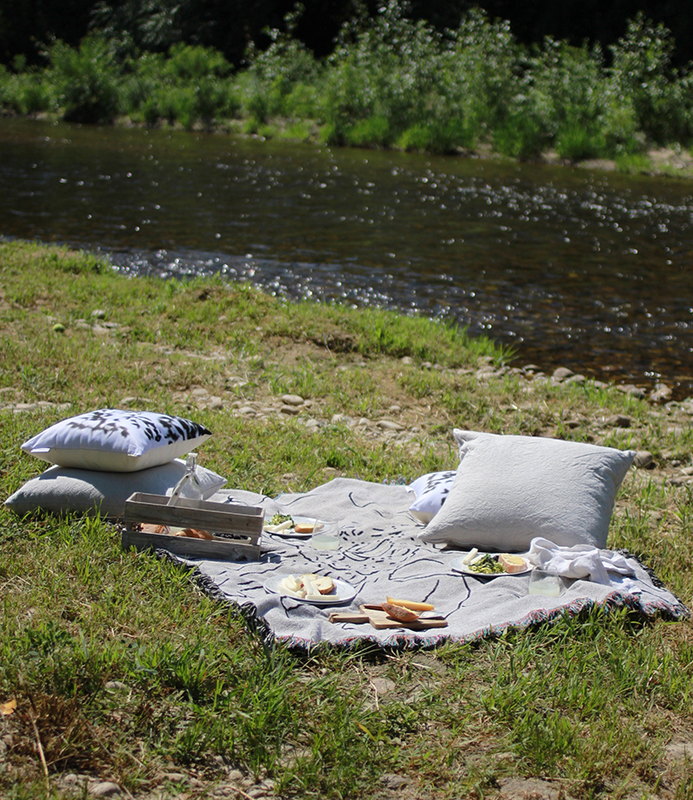 Of course you're going to want to be comfortable during a picnic so make your own cushions to lounge on and don't worry too much about getting them dusty, everything is washable. 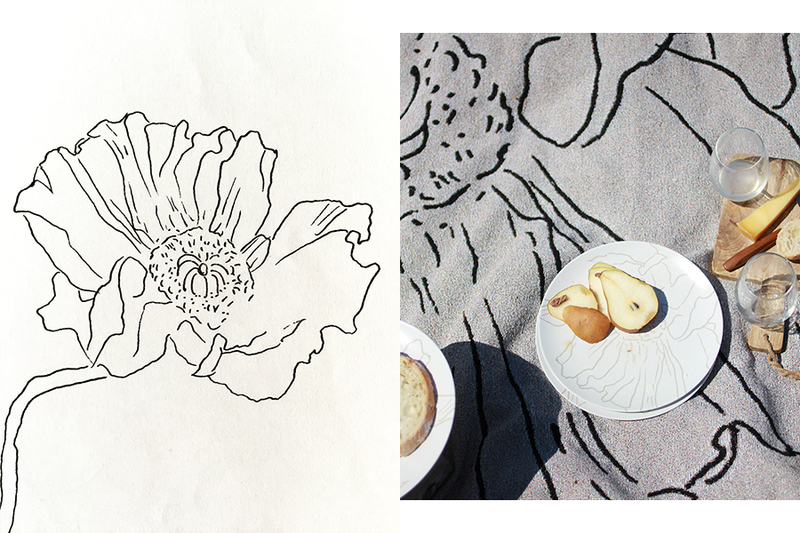 The blanket has an oversized poppy drawing on it, courtesy of my husband's skilled hand (above, left). Using the same drawing I also created a lighter version for a set of dinner plates. 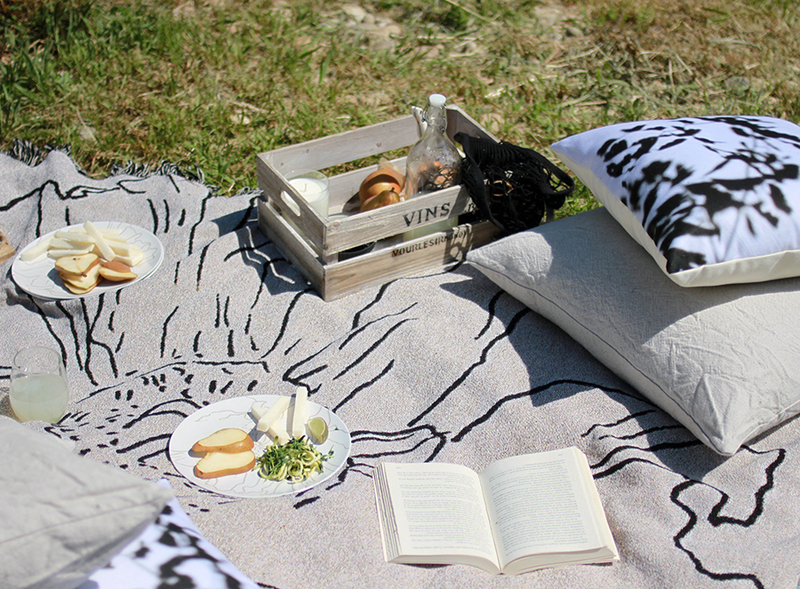 Staying with the organic/plant idea, the cushions are printed with a photo I took, a shadow of a fern plant in my yard. 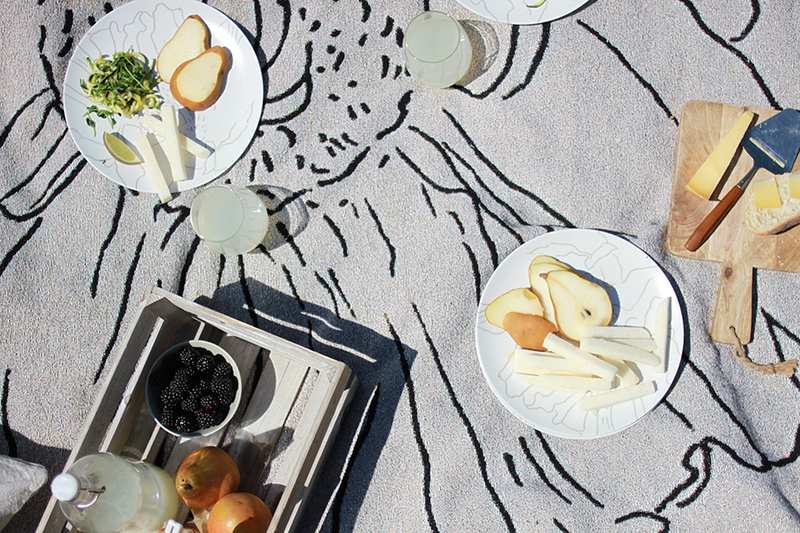 Picnics are fun but can also be a lot of work. You need to carry everything needed to eat and relax comfortably, even though I forgot silverware this time (oops!) it's important to have some solid you carry heavy things in but that also creates a flat surface on the cushiony grass or sandy ground. A wooden crate carried food, candles, lemonade and plates but also created a solid place to keep drink or other items form tipping over. In case you're wondering I brought some fresh foods like zucchini noodles, jicama slices, fresh pears, parrano and a baby boule. If you go out in the evening some candles are also a nice idea, or if you're bringing friends this would also make a nice gift. I went out in the afternoon so we didn't need to light them however, choosing the grapefruit scent I can tell you it smells so good, burning it inside makes my house smell fresh and slightly of citrus. You can also customize wine glasses with Shutterfly, I could't quite get a good close up of the writing but just know they were hilariously ironic. Or just a simple monogram would also do the trick! 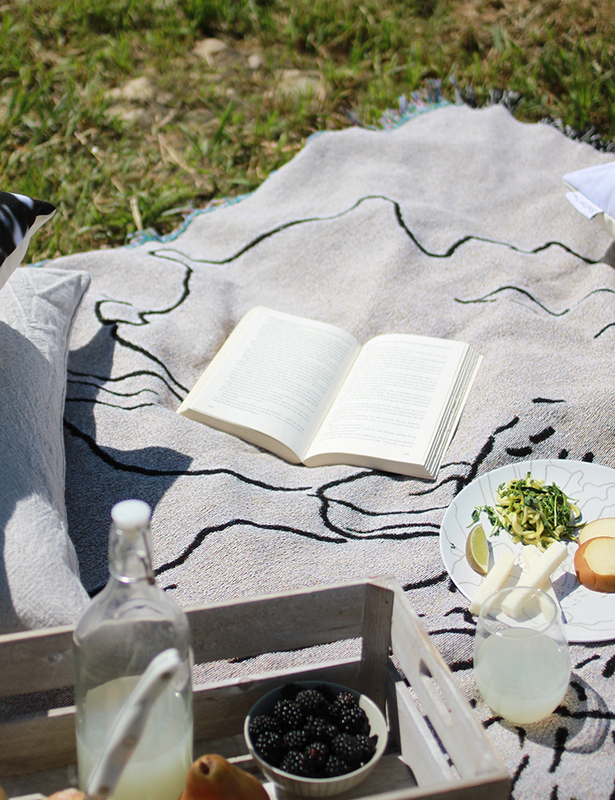 Some additional and slightly obvious tips would be to remember utensils (unlike me) including knives and/or a cheese slicer with a wooden board for cutting, bring a good book along with a wide brimmed hat and probably sunscreen, especially if you have time to spare and want to take a short nap. You can also listen to music but in my case, the sound of water was much more preferable! This post is sponsored by Shutterfly. Awaken your space with your vision. Shop Shutterfly Home Décor for personalized home accents that are uniquely you.